Posts with tag: "Back to School Shoot"
Good morning. Happy first day back to school for most moms in my neighborhood. Such a joyous time of fresh new clothes, school supplies, and packed lunches. This particular year, 2013, is very special for us. We have a kindergartener! A very very very excited kindergartener. She wants to be big. She wants to do what the big kids do. She wants to learn how to read, tie her shoes and eat a hot lunch. She wants to go through all the paces we go through and I'm ready for her to do so. I see so many parents posting that they're not ready for their kids to grow up. It's happening too fast. I personally feel it's exactly what she's supposed to be doing right now and we couldn't be happier for her. Sure I'll miss my grocey shopping buddy and our manicures together but I look forward to watching her become an amazing girl/teenager/woman someday. Although Lily doesn't start until next Monday my heart is already full for her future days ahead. 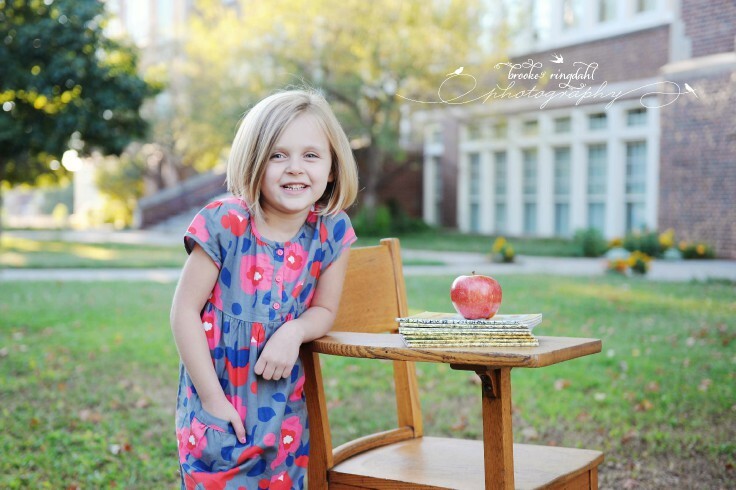 So bring it on Education we're bringing you another Kindergartener! xoxoHere are a few photos from Lily's Kindergarten shoot. Yes I'm THAT mom and will always be. Good thing she's THAT kind of kid too. Feel free to leave Lily well wishes for her first day... All images are created and coypright of Brooke Ringdahl Photography.